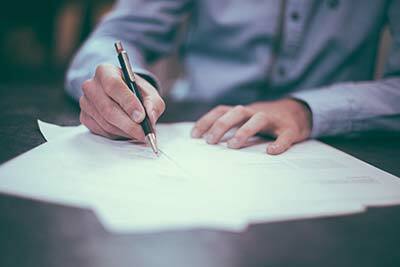 Can an Attorney Open a Claim on Your Insurance Without Your Agreement? If you haven’t hired a lawyer to represent you, no attorney has any right to open a claim on your behalf with any insurance company. On the other hand, if you have hired a lawyer to represent you and help you file a claim, that lawyer should never file a claim without first notifying you and getting your agreement. A good lawyer will consult with you before making any major decision regarding your claim. This means your lawyer should call you or sit down with you to discuss the details of your claim, the best possible scenarios under your situation, and ask for your consent to move forward. In fact, that is what we do with all of our clients and we take pride in a fully transparent process from start to finish. This type of process, where everyone has a seat at the table, always yields much better results. What happens when I hire an attorney to help me with my claim? Once we sit down and collect the details of your accident, we review all of the potential factors that could go into filing your claim and map out a course of action. That course of action may be very different depending on your individual situation. Once we start developing a roadmap to success, we consult with you and discuss exactly what we plan on doing and how. Often, our efforts involve investigating what happened in the accident by looking at all of the information available, seeking new information, and obtaining all the relevant documents, such as police reports and photographs, eyewitness testimony, property damage evaluations and reports, and even camera evidence to make sure we can build the best possible case. From there, our team helps determine what insurance company is available to provide the best coverage for your accident once we put the facts together. This involves contacting the insurance companies that are involved in the accident — in the case of a multi-car crash, it can get tricky, so we do our due diligence to ensure we work in the best interest of our clients. We typically contact insurance companies by letter and telephone. Once we contact the respective insurance companies, they open a “file.” This is not an official claim, but a file that the insurance company uses to document our communication. This allows us to interact with the insurance company in an official capacity where we can start the relevant conversations to move the claim process forward. When this happens, the insurance company will assign the “file” a claim number, despite it not being an actual claim. Can an attorney make important claim decisions on my behalf? Prior to submitting an official claim or sending any sort of legal demand or request to an insurance company, your lawyer should always speak to you about your claim, lay out the details and prospects of your claim, and inform you about why they want to make a particular claim or demand. At this point, you as the client have the option of asking your attorney to not make that demand or claim. The client is always in charge of what the case will settle for and a lawyer can not force you to settle. Can an attorney decide my settlement for me? Settlement discussions can often be uncomfortable for clients who feel that they’re not informed enough to know if the claim they’ve been offered is sufficient or fair. That’s why we pride ourselves in developing trusted relationships with our clients through a fully transparent process that makes settlement conversations comfortable and informed. Ultimately, you as the client have the final say on whether you want to settle or demand more, but it’s a trusted relationship with your lawyer that should give you the confidence to make the right decision when the time comes. Should I file a claim for every accident I have? Many people feel that they shouldn’t file a claim for every accident they’re involved in, especially if it’s a minor accident or if they feel the damage is less than what they would have to pay for their deductible. We tell our clients that it’s a bad idea not to disclose information about an accident to their insurance company, even if they don’t file a claim. You can often simply inform your insurance company that you’ve had a minor accident or that some damage has occurred to your vehicle through no fault of your own, without filing an official claim for money. We advise our clients to be as transparent as possible with their insurance companies because their failure to report an accident could later be used as a reason not to pay out their claim. Additionally, insurance companies keep their own databases, known as “ISO reports,” where they actually write down information about any accidents you may have been in — even if there is no official police report — and keep them on file to determine your rates later. Most insurance companies submit claim information to a single database and all subscribing members have access to this information. This means that if you have an accident chances are that your insurance company will find out about it. What should I look for in a good lawyer to handle my claim? We suggest that you always seek out trusted, reputable, legal professionals who have less interest in making a “quick buck” than they do in upholding their own professional standards and integrity as legal professionals. You will have many choices in your search for legal help, but we recommend that you choose a car accident lawyer or law firm that is completely transparent, does not promise or make false assumptions before first knowing all of the facts and information of your case, and someone who is a trusted and respected member of their community. If you check these boxes, you should be confident that the car accident lawyers you hire will be the right ones.